Thanks to Dr. Caglar Sarigul and Dr. Enver Vardar, Associate Professor, S.B. Izmir Bozyaka Training-Research Hospital (Turkey) for contributing this case. To contribute a Case of the Week, follow the guidelines on our main Case of the Week page. (1) We have added a new section of our Books page for Book Series. Now you can check your favorite series to see the latest books offered (books are sorted by most recent publishing date first). If your favorite series is not listed, please email Erin at erinthomas3161@gmail.com with the details. 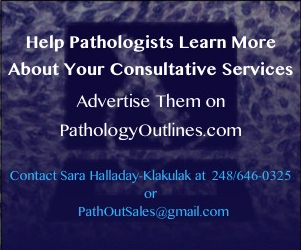 (2) Each quarter, PathologyOutlines.com donates 10% of our Amazon commission to a non-profit. For the second quarter of 2016, we will be contributing to the Detroit College Promise Scholarship Fund at the Detroit Public School Foundation. If you have an end of the year book stipend still left to use up before June or July, remember you can buy pathology, non-pathology related books or any other items by through our Amazon link. Besides purchasing from Amazon.com through our website, you can donate specifically to this effort by clicking here. An 83 year old man was admitted to the surgery clinic with dysphagia. 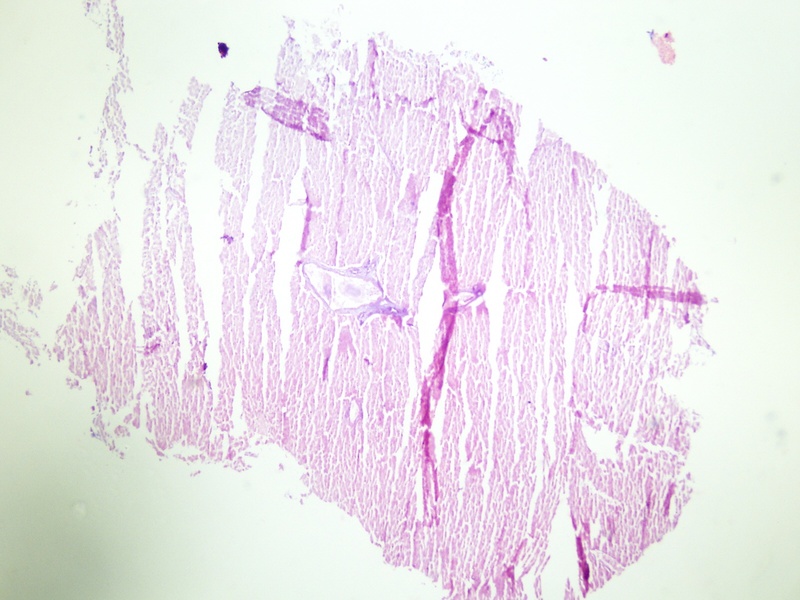 An ulcerated obstructive mass was identified at 20 cm in the esophagus during upper endoscopy. Multiple biopsies were taken from this mass. 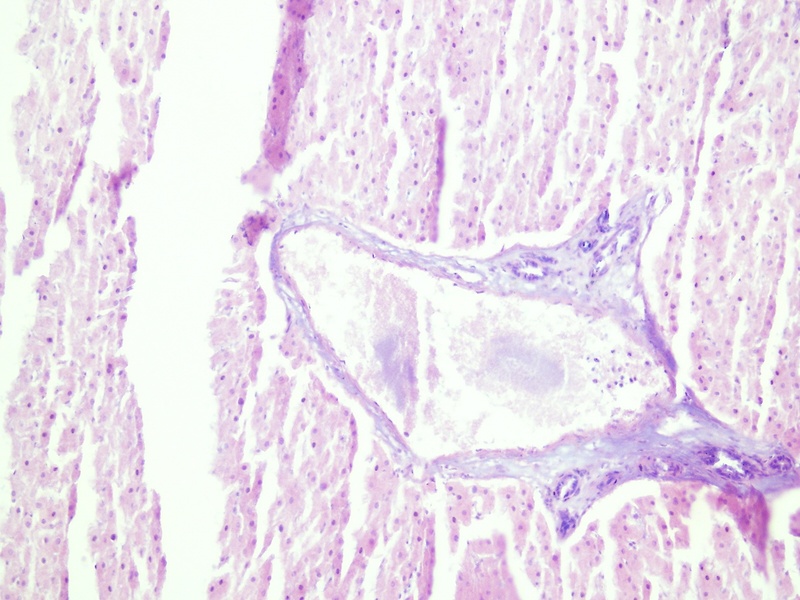 The biopsies show liver tissue with diffuse thermal artifact. No esophageal squamous mucosa was seen. The possibility of a specimen switch was considered, but on further investigation into the patient history, we learned that the patient had eaten lamb liver 4-5 days prior to the endoscopic examination. 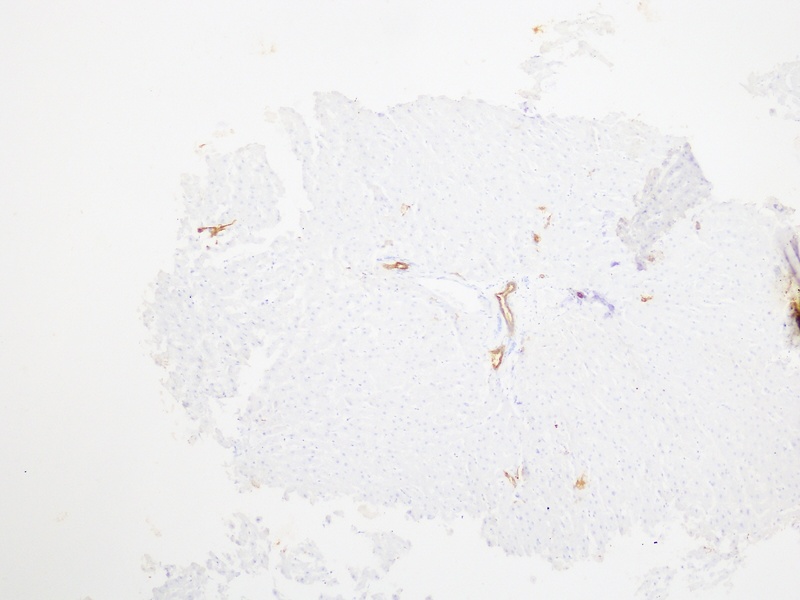 Immunohistochemistry was performed on the biopsies. 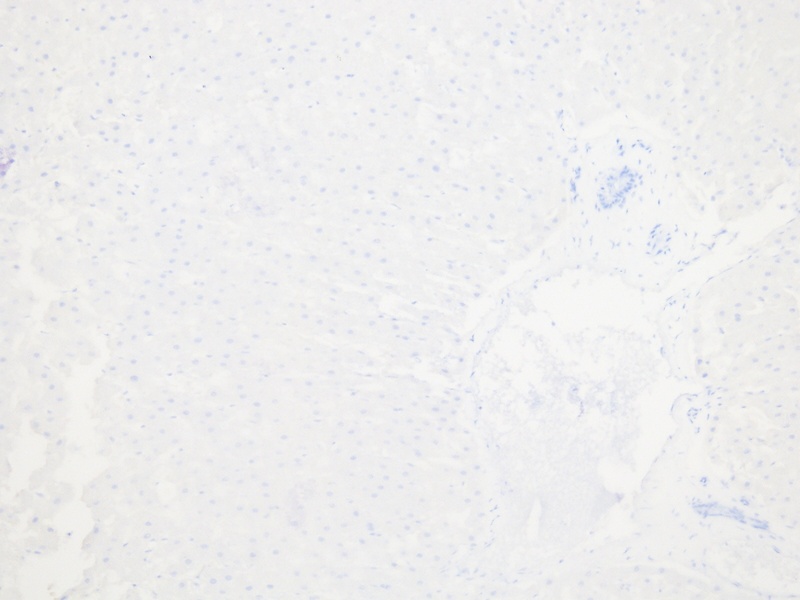 CK19 was positive in the bile ducts as expected, but CK7 was negative in the bile ducts (with aberrant background staining in the hepatocytes due to endogenous peroxidase activity) and HepPar1 was negative in the hepatocytes. 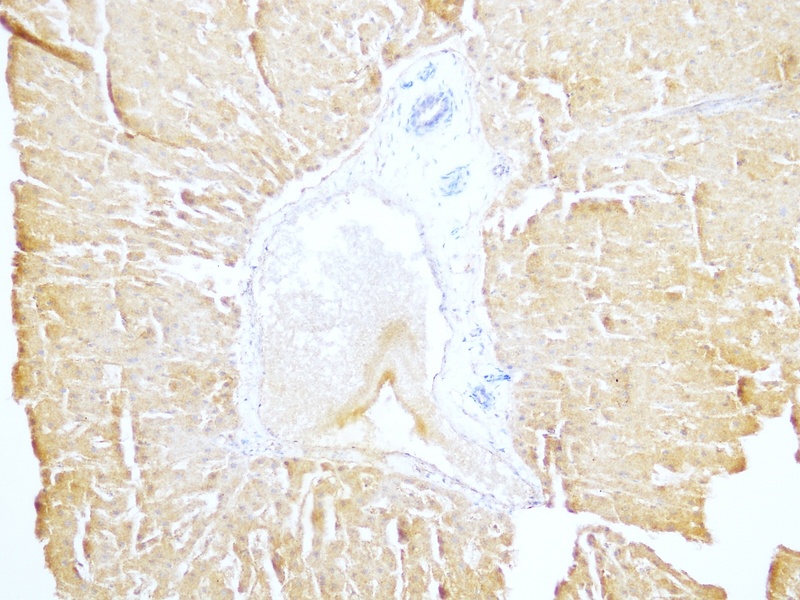 The datasheets of the CK7 (clone OU-TL12/30) and HepPar1 antibodies (clone OCH1ES) indicated that they react only with human and rat tissue. This information, combined with the patient history, supported the diagnosis of impacted food (lamb liver). The extensive thermal artifact was felt to be due to the food having been cooked. On follow-up, the patient's dysphagia had resolved, and on endoscopy the obstructing mass was gone. Esophageal food impaction occurs in approximately 13 per 100,000 adults per year. The condition is most common in patients with underlying pathology such as strictures or eosinophilic esophagitis. Less frequent causes include esophageal cancer and motility disorders. Patients with impacted food can have symptoms of dysphagia, odynophagia, retrosternal pain, foreign body sensation, vomiting and respiratory issues from tracheal compression. Patients can clearly specify the onset of symptoms, although the location of the pain may not correlate with the actual area of the impaction. Most small foreign bodies (including non-food objects) pass spontaneously through the gastrointestinal system in about 4-6 days once they have cleared the esophagus. Impacted foreign bodies should be removed within 24 hours to prevent complications such as perforation, abscess and fistula. Typically, impacted food in the esophagus is treated by breaking it up and pushing it into the stomach, but if this is not possible, it can usually be retrieved using different types of endoscopic devices. Surgery is reserved for cases that fail endoscopic removal, or if perforation is suspected. Follow up should include a diagnostic workup to rule out underlying disease (Endoscopy 2016;48:489).